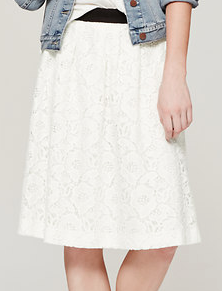 The return of the lace skirt..I told it would be back and re-styled yet again! Probably because I just can't get enough. I love how feminine it is, but it still makes me feel extra sassy when I'm strutting around in it. This go 'round I chose a chambray as the weather has started to get just a bit cooler. Speaking of a chambray, it is one of the few items that has made it's way onto my 'Fall Edit' list. A chambray is very versatile. It can be worn as usual, tucked in, or layered over a tee (unbuttoned, of course) for a casual look. All three looks are appropriate for this time of year. As for the skirt, I think it's important for every girl to have a skirt that makes her feel like she could rule the world. For me, this is it! I am really into knee-length skirts and I'll be sharing some of my favorites with you soon! I'll also be sharing another Fall Edit list of some go-to products to get you through fall. As for accessories, I layered on the look-alike necklace that I found at an antique store a few weeks ago. It resembles a similar style that can be found at BaubleBar. Since my chambray includes some accessories as well, I wanted to go for a more simple look. I felt like there was a lot going on. The skirt has texture, the shoes are just sassy, and the necklace makes a statement. Although it seems like a lot typing it all out, I think it compliments each other very well. But I'd love to her what you think about today's OOTD..so leave some love in the comments below.